Guy Kawasaki is the chief evangelist of Canva, an online graphic design tool. He is on the board of trustees of the Wikimedia Foundation, a brand ambassador for Mercedes Benz USA, and an executive fellow of the Haas School of Business (UC Berkeley). Guy was also the chief evangelist of Apple. 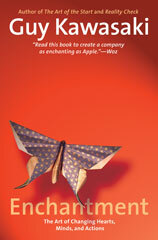 He is also the author of The Art of the Start 2.0, The Art of Social Media, Enchantment, and nine other books. ​His in-depth knowledge of the high-tech industry combined with his years of management experience enable him to address a wide range of audiences. His particular strength is the ability to quickly understand diverse industries and incorporate his pre-existing knowledge into a highly relevant and customized speech. Guy Kawasaki is highly flexible and is willing to customize a speech that is tailor-made for any audience. Guy Kawasaki gives over fifty keynote speeches per year. His clients include Apple, Nike, Gartner, Audi, Google, Microsoft, and Breitling as well as dozens of trade associations. His topics include innovation, enchantment, social media, evangelism, and entrepreneurship. Guy Kawasaki demystifies social media in this speech and makes social media a useful and powerful marketing tool. 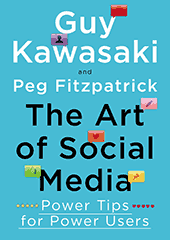 Many people believe that Guy’s book by the same name is the best book ever written about social media, The Art of Social Media: Power Tips for Power Users. Guy Kawasaki is one of the few people in the world who can credibly give this speech. He draws from his experience working for Steve Jobs as the Chief Evangelist for Apple and applies these lessons to business practices. This speech explains how to create innovative products and services using tactical and practical techniques. It is best suited for organizations that want to jump to the next curve. It is Guy Kawasaki's most popular speech. This speech is how to create a new company. It reflects the knowledge Guy Kawasaki has gained from Apple, starting multiple companies, working as a venture capitalist, and advising dozens of companies. 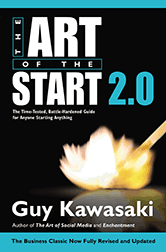 His book by the same name is the de facto standard for books about entrepreneurship, The Art of the Start 2.0: The Time-Tested, Battle-Hardened Guide for Anyone Starting Anything.